Though, I was so excited on diving in Bali, I didn’t believe it would be this eventful and memorable for the incident I narrowly escaped from. Anyway, I am safe, learnt the lessons and now able to document what happened that day. I knew Bali offer both big fish as well as small macro subjects. I was particularly interested in macro subjects and got a new focus light ordered from USA, a new addition to my photography set-up, which arrived on time. Its June,2017 and all set for the next expedition. My first diving was planned to do in Padang Bay area which got a big reputation on different macro subjects such as Sea Horses, rare Scorpion Fishes species and etc. Diving in murky waters in search of small subjects (Muck Diving) is not for everyone. So I had to charter a vehicle as well as a boat of traditional Balinese style for us to reach the dive sites. Padang Bay is a small fishing village in a Bay and not many divers seemed to have attracted to. Though day was rainy and gloomy, I managed to dive while taking photos of wonderful marine creatures I had never seen anywhere before. 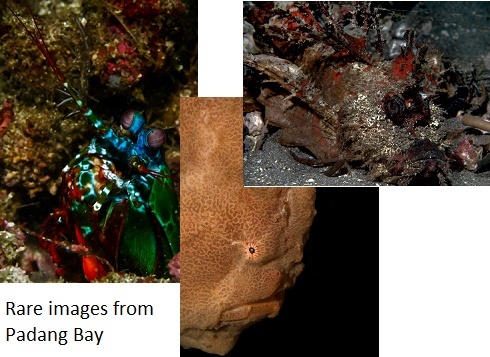 I managed to captured the photos of Sea Horses, Devil faced Scorpion fish, Leave fish, Frog Fish and many more. One thing, I wanted to say about these dives are I used more Oxygen than usual percentage to increase the bottom time. This technique is called Nitrox diving. 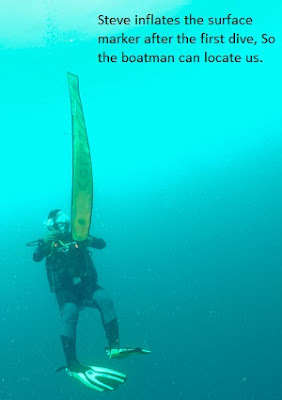 While this gives benefits to the diver, it comes with another trade-off which is the limitation of depth. Exceeding the depth limits could result Oxygen toxicity; a potential fatal consequence. In other terms, divers who use Nitrox should adhere to the recommended limitations. Anyway, story was different in my next mission of photographing big fishes which was planned to do near the island called Nusa Penida. I was already advised by dive master Steve about heavy currents we could encounter and I got prepared myself. 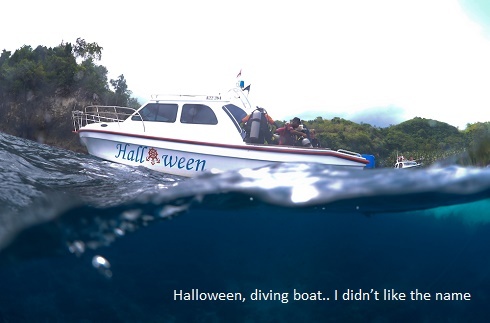 Anyway, I had a wired feeling when I saw the name of the diving boat, Halloween! As a classical maritime expedition enthusiast, I knew one of the ships Sir John Franklin sailed and end up with great tragic was called HMS Terror. 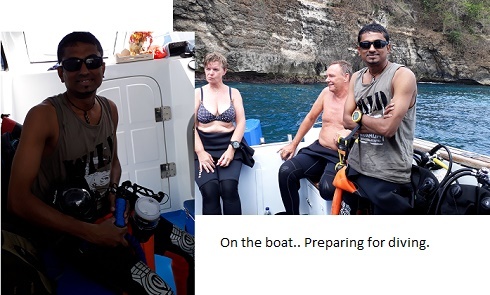 I got in to the diving boat Halloween and sailed with my dive master and another team of Dutch divers lead by a very experienced diving instructor. First we dived in a site full of boulders and strong current going through them making room for a cleaning station for Manta Rays. This place was called Manta Point. 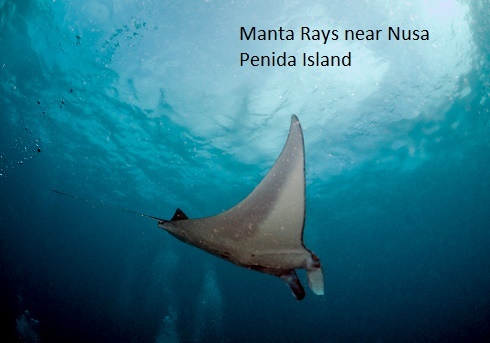 Visibility wasn’t great, but I managed to capture few descent pictures of Mantas. Once I got into the boat for surface interval I felt it was pretty cold and wind was strong, but I hadn’t brought any jacket to warm myself. Mistake number one! Second dive was planned to do in a site called Crystal Bay. During the dive in Crystal Bay, we had to sneak through a very cold current which made me feel really cold and chilly, but I made my mind thinking it will be fine soon. When we were about to end the dive, all in a sudden a Sun Fish (locals called Mola Mola) appeared from a depth and we all were astonished to see it. Then I thought I should try to take some photos. What happened to me next was not something I can explain alone, but with Steve’s point of view. As we suspected later on, I may have developed Hypothermia by then, due to exposure to the too much coldness. Trying to take photos of the Sun Fish had brought me to a deep trench alone with the fish itself. I couldn’t observe anything since background of the fish was just blue and seascape was behind me, leaving no physical reference to feel I am moving deeper. 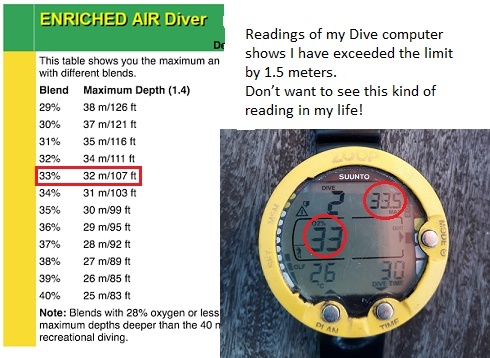 My dive computer had beeped repetitively since its fed with information including my Oxygen percentage (33%), but I may have ignored it due to the confusion state resulted by Hypothermia. Even Steve had tried to stop me without any success. Then all in a sudden some diver reached me and signaled to ascend. This was the fateful moment for me and, for some luck, or good karma, I started to realize everything happened to me including ignoring of dive computer alerts and etc. It was like my consciousness was re-established in 11th hour. I knew I was in danger and I managed to check my air levels and do the needful steps to safely ascend. What really has happened was, I had ignored my buddy, Steve’s signals and gone down with the fish. Suddenly, Steve had realized he can’t follow me either, since his Oxygen percentage was higher than mine. He could reach the death zone of Oxygen toxicity sooner than me. Then he had searched for Dutch diving instructor who was diving with normal air (20% Oxygen, allow dive deeper, but for a short period of time) and asked him to go and get me. For my great luck, his signal became an eye opener for me. After all, we three had a lengthy discussion based on each other’s observation and circumstance and tried to understand what may have happened. From my side, I had to assure, I had never been an irresponsible diver; no such history of mine. We had to believe Hypothermia may have affected my consciousness. One lady diver from Dutch team also had witnessed me almost shivering during the surface interval. When I went back to my family... My elder daughter came to me and ask how was the diving..as usual..
“It was fun!” I said. That evening, I had a Balinese Beer in the beach looking at the fading sun in horizon…my family was sitting around me. I felt the preciousness of life. It was a kind of universal feeling that was floating above the day-to-day life and entities. I still try to contemplate the unfamiliar shape of that feeling.